NIA-CHARLESTOWN NEVIS (September 26, 2011) — Community development is purposeful planned change from the bottom going upwards was how Minister of Social Development in the Nevis Island Administration Hon. Hensley Daniel described the construction of an Adult Education Centre recently commissioned in Barnes Ghaut Village and number of other community centres in areas on the island that were nonexistent before. 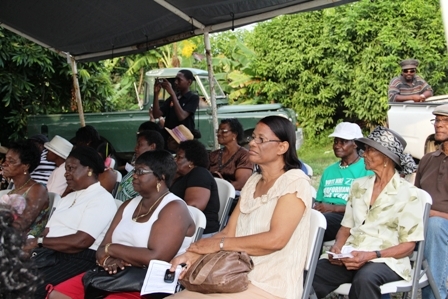 He was at the time delivering remarks at the handing over ceremony of the Barnes Ghaut Centre from the Basic Needs Trust Fund on Wednesday September 21, 2011. “We need to remind ourselves that in community development, people must always have the view that they can do something about the problems in their community or about the challenges. “I am sure in Barnes Ghaut they will leave out one of the tenets of community development in which the community attempts to combine outside assistance with organised local determination to bring about meaningful change,” he said. The Minister added that he was convinced the community of Barnes Ghaut was well positioned to make ample use of the new community centre. “If we take on board the view that community organisation is a process by which the community identifies its needs and objectives, orders those needs, develop the confidence and will to address those needs, finds the resources and in so doing deepens and widens collaboration and cooperation [then] there is no better community to do that than Barnes Ghaut. “I am sure you have been doing that over the years and the centre is just now the focal point of the community,” he said. The Barnes Ghaut Adult Education Centre is one of three community centres constructed in the Parish of St. Thomas – one in the village of Jessups and the other in the village of Cotton Ground. 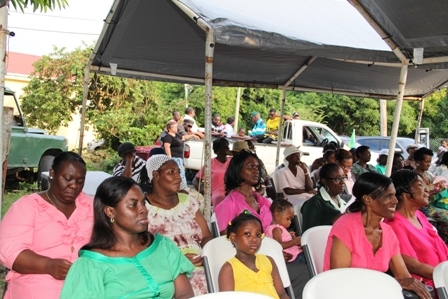 Notwithstanding, Mr. Daniel told the residents of Barnes Ghaut that the onus was on them to keep the centre active and to utilise the programmes that would be available to them from his Ministry. He explained that the centre would have the services of the Ministry since a community development officer would be assigned to the centre. He explained that in recent years the NIA had restructured the Department so that community development workers no longer were required to operate from a desk in Charlestown. “What we have done also in our Ministry of Community Development is to restructure the Department so that the Community Development workers do not work in Charlestown, except that they are the Charlestown representative. “So we have a Community Development Officer for the St. Thomas’ parish and we will have somebody on a permanent basis to manage the community centre, to coordinate all the programmes and to tell you what is available when. “That is going to happen as soon as we open the building. So somebody is in charge of the centre from the Ministry of Social Development,” the Minister explained. Mr. Daniel told those present at the Ceremony that the centres would be equipped with chairs, tables and computers. He also noted that the chairs were not to be rotated among centres because of the difficulties finding furniture that had been loaned out. What we have decided to do in Community Development we will get some furniture that can move around but Barnes Ghaut’s chairs and tables will remain in Barnes Ghaut; those in Jessups will remain in Jessups and so on so that we have proper accounting,” he said. 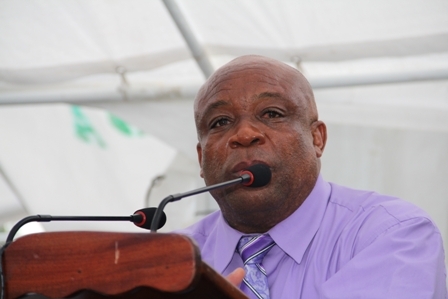 The Minister urged the residents to take care of the new facility, the equipment and furniture they would be provided with since the ministry was not in the business of purchasing chairs and tables on an annual basis. “We have ordered the chairs and tables for the centre and we are going to give you and we expect you to act in good faith so that the centres can help to do the work that we have set out to do,” he said.